The VLP’s primary referral areas are Family Law, Elder Law, and Consumer Law, including Chapter 7 bankruptcy, CLARO, and the Foreclosure Intervention Program. In addition to serving those in need through direct representation, the VLP has established several innovative education and outreach programs for seniors and self-represented litigants. VLP volunteer attorneys provide assistance to families and individuals in crisis, providing representation and counsel on a variety of family law matters including child and spousal support, custody, visitation and uncontested divorce. The family law program is designed with a keen sensitivity to resolving familial conflicts with a minimum of disruption and animosity. The VLP has an active self-represented uncontested divorce program that assists many women and men whose lives are at a standstill because of a relationship that has broken down. Most are referred to the VLP by the Office of the Self-Represented in Supreme Court. Others learn about the VLP clinic from other legal service providers. 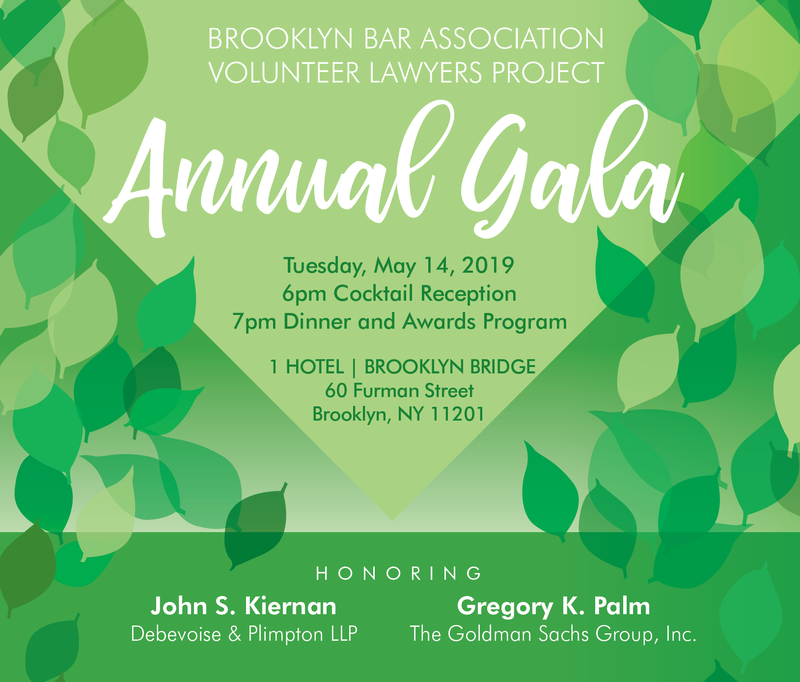 Volunteer attorneys provide assistance with creating wills and designating power of attorney, emphasizing that a low income should not prevent individuals from the dignity of future arrangements. Volunteers make scheduled presentations at senior centers across Brooklyn to teach the elderly about the importance of advance medical directives. Following presentations, a question and answer session identifies other areas of concern to seniors. Follow-up appointments may be made with seniors who have specific legal issues and meet the VLP financial eligibility criteria. Consumer bankruptcy protection is often chosen as a last resort by individuals and families facing insurmountable debt after trying to cope with job loss, a family crisis, or serious medical problems. VLP volunteer attorneys assist individuals who need to re-order their finances by drafting bankruptcy petitions and by representing them in Chapter 7 proceedings in the United State Bankruptcy Court, Eastern District of New York. Civil Legal Advice and Resource Office (CLARO) The Civil Legal Advice and Resource Office (CLARO) is a free, weekly walk-in clinic at Kings County Civil Court where consumers can obtain free information about debt collection. 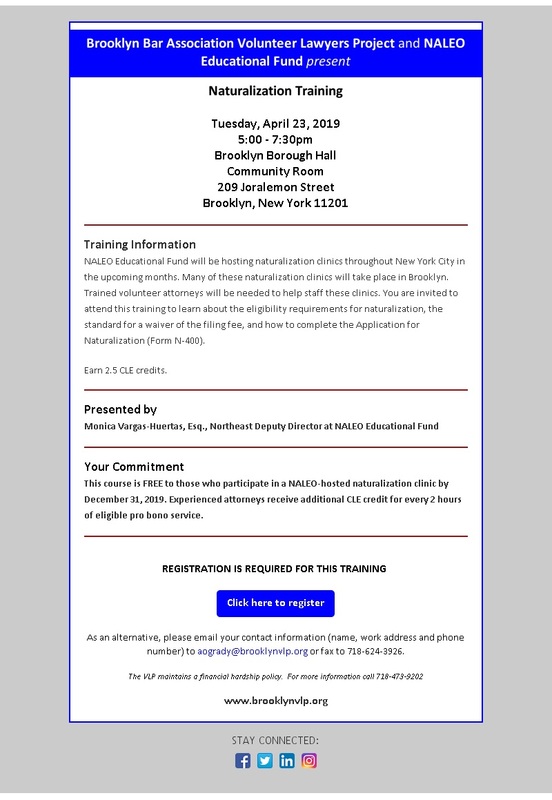 CLARO is a joint project of the VLP and Brooklyn Law School, with the collaboration of MFY Legal Services and Neighborhood Economic Development Advocacy Project (NEDAP). It was created in cooperation with Kings County Civil Court to address the needs of unrepresented consumer debt litigants. CLARO is held every Thursday at Kings County Civil Court (141 Livingston Street) from 2:30 to 4:30 PM and 6:00 – 8:00 PM. At the start of 2013, the VLP expanded its program to full direct representation for Brooklyn residents facing foreclosure. VLP volunteer attorneys represent individuals throughout the whole foreclosure process, including foreclosure motion practice, bad faith hearings, foreclosure defense litigation, and settlement conferences in Kings County Supreme Court. The VLP also runs a clinic three times a week, the Foreclosure Legal Assistance Group (“FLAG”) in Kings County Supreme Court. FLAG offers information and resources on how to proceed with the foreclosure process to individuals who have already attended pre-settlement conferences. 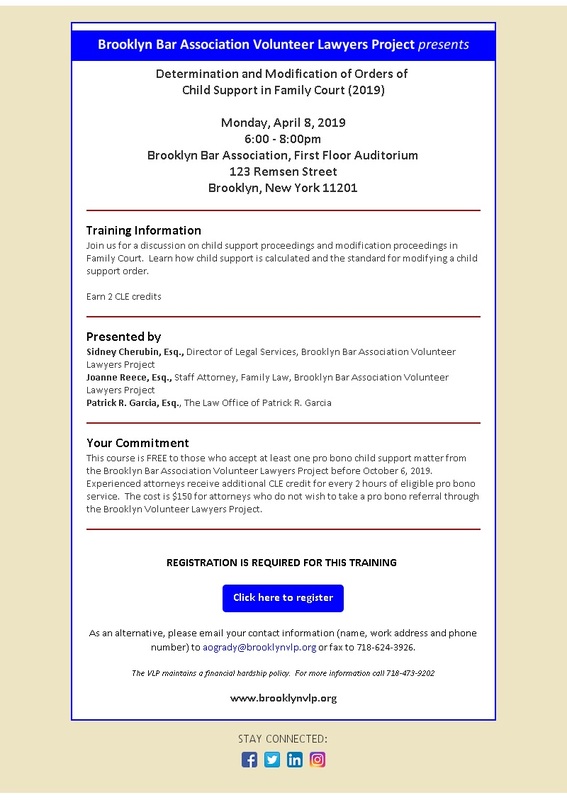 Staffed by VLP volunteer attorneys and specially trained and supervised Brooklyn Law School interns, FLAG is open every Monday, Tuesday, and Wednesday from 2:30 to 4:00 p.m. In January 2009, the VLP initiated a multifaceted legal services project assisting clients with obtaining guardianship of a mentally retarded or developmentally disabled person. In New York State, parents or guardians of persons who are mentally retarded or developmentally disabled are considered the natural guardians of their children until their 18th birthday. After a person reaches 18 years of age, he or she is presumed to be a legally competent adult and able to manage his or her own affairs. If an individual is not able to manage on their own, a parent or legal guardian must obtain legal guardianship under Article 17A of the S.C.P.A. Volunteer attorneys assist with Article 17A guardianship proceedings in Kings County Surrogate’s Court to designate a parent, sibling, other relative friend or an organization to act on behalf of a person with mental retardation and/or developmental disabilities who has attained the age of 18. Before the court will appoint a guardian, it must be satisfied that the guardianship is necessary and that it is in the best interest of the disabled person. The VLP is partnering with other organizations to provide critical assistance to immigrants and other foreign-born New Yorkers. This includes assisting parents with emergency planning in the event they are detained or deported, helping individuals complete naturalization papers to apply for U.S. citizenship, and organizing trainings on immigration law for volunteer attorneys.